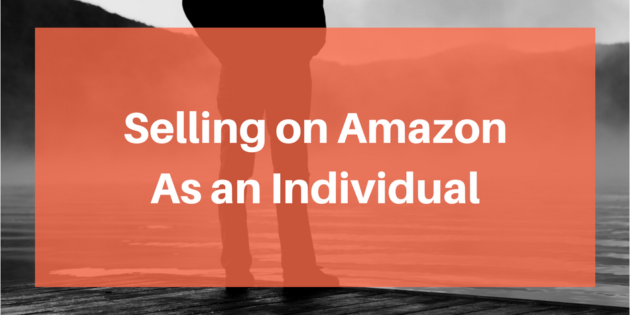 The official journey to becoming an Amazon seller starts at the registration process. It’s the very beginning, where you’ll be asked to choose between becoming an ‘individual seller’ or a ‘professional seller’. We’re going to lay the groundwork for important differences, commonalities, what you should be aware of with the overall process. The ‘too-long-didn’t-read’ version of this post is that the professional sellers account with Amazon has advantages that far outweigh the individual account. This is mainly because you cannot create brand new listings with an individual account. Therefore, if you are selling new products that aren’t on the platform already - you will not be able to introduce new ones. Regardless of whether you are selling as a wholesaler or private labeller. This is largely the same for both professionals and individual accounts and you can even start the process under your customer account. But only if your customer account happens to already be your company account. Otherwise you’re going to have to create a new account for your company. Just be mindful of those steps so you aren’t caught off guard and can have your account set up promptly. The mistake most new Amazon registrants make is that they focus on the price of each plan as the deciding factor. An individual account charges $0.99 per item sold and the professional account is a monthly fee of $39.99. Quick math tells us that you need to sell 40 units in order to justify getting the professional account. You won’t be able to create new listings: This means individual sellers cannot create or sell products that aren’t already listed on Amazon. The highest margins come from owning and creating the product yourself (private labelling.) Even if you were a wholesaler and were given first access to a new product line, you can’t register them on Amazon without a professional account. This also includes creating new products that are essentially bundles. You can’t sell in every category: Certain categories on Amazon are gated. Such as personal care, beauty, health, clothing, and a bunch more. Only sellers with a professional account can register to sell under these categories. You can’t compete for the buy box: The buy box is where wholesalers compete for the same product. They rotate in and out of the ‘online shelf’, giving other sellers the opportunity to access Amazon’s customers. You won’t be able to sell anything as a wholesaler unless you have a professional account. Those are essentially the most important aspects you’d need to consider when selling on Amazon. Beyond that, professional sellers take advantage of better reporting from the API connections Amazon offers, bulk listing from spreadsheets, the ability offer gift wrapping, and customized shipping rates. You don’t have to ‘pre-pay’ for 40 shipped products and can pay one and a time. That’s it. There really isn’t any other advantage to the individual account except that you aren’t pre-paying a monthly subscription. Of course, professional accounts have tons of benefits and is a must for certain Amazon business models to work. Both pay referral fees for affiliates. You can learn more about Amazon affiliate training in our course that comes with the Amasuite software. Both have access to fulfilment by Amazon. This is where Amazon handles the logistics of getting your product to their customers by holding your product in their warehouses. But the truth is, Amazon FBA isn’t very useful unless you are able access the buy box or create new listings. As I mentioned earlier, the route that makes the most sense for 99% of those who wish to sell on Amazon is to become a ‘professional seller’. The benefits far outweigh the fact that you have a monthly subscription to have full access to Amazon’s customers. If you aren’t sure about whether your product is going to sell more than 40 units, it is unlikely that your product will succeed at launch without running advertisements. People have had success by lowering prices far enough to get their first reviews and initial buyers, but running sponsored ads (accessed only with a professional account only) is the only way to guarantee your spot at the top of search results. It’s the long game we’re playing here, so save yourself the extra step in the future and commit to using all the tools provided by Amazon’s professional account today.